This FRENCH TOAST WITH ALMOND MILK is a great Dairy-Free French Toast recipe for those with lactose intolerance (or anyone who just prefers the flavor of almond milk). 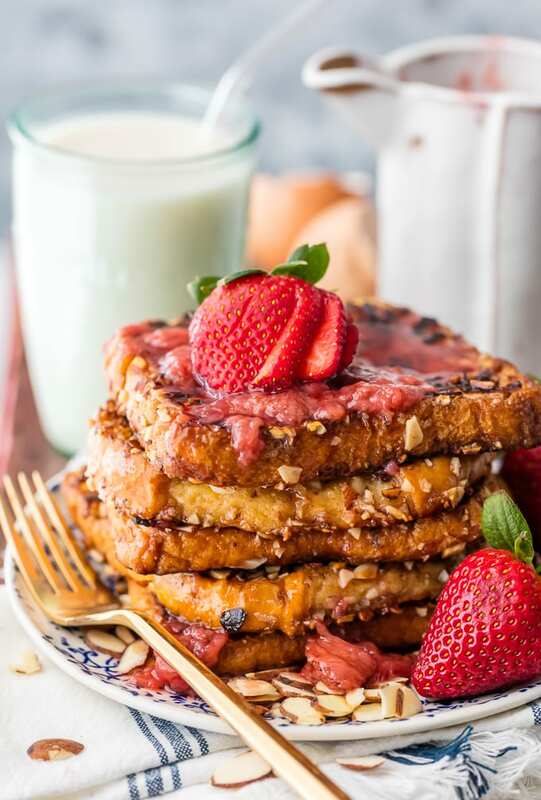 We love starting our mornings with this Crunchy Almond French Toast, and we added a delicious Homemade Strawberry Syrup! Fresh almonds along with the almond milk really adds to the overall flavor. It’s unique, bursting with flavor, easy, and made with love. This french toast recipe seems too good to be true! French toast with almond milk is a delicious dairy-free french toast option for all. I’m loving this Crunchy Almond French Toast recipe for breakfast. The brioche bread, freshly chopped almonds, and homemade strawberry syrup make it feel so decadent. Even better is that we made this French Toast with Almond milk and margarine to make it dairy-free! Whether you’re looking for dairy-free french toast or not, the almond milk just adds to the overall flavor. I mean, if we’re really going to make good Almond French Toast, we have to use almond milk, right? It blends together seamlessly with the rest of the ingredients to create the most delicious french toast (which just happens to be dairy-free). And the crunchy almonds add the best texture. I could eat this french toast every single day! It’s perfect for a nice family breakfast, or a fun Sunday brunch. 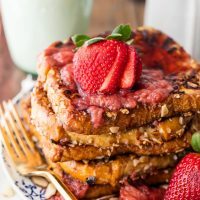 And the roasted strawberry syrup not only adds flavor, but it also looks really pretty drizzled over the french toast. 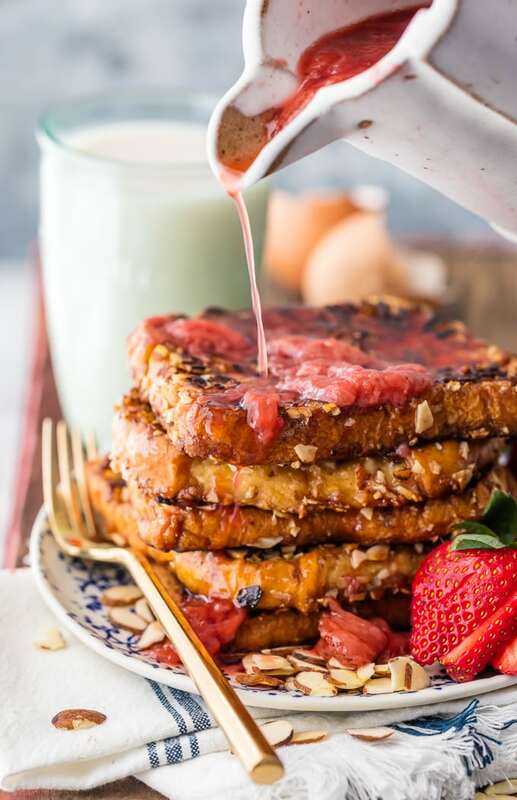 Make this French Toast with Almond Milk and Homemade Strawberry Syrup for a decadent dairy-free breakfast! I love almonds. They have such a specific taste without being overwhelming. 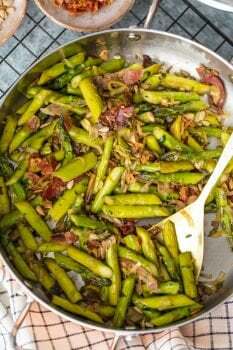 The fresh, chopped almonds in this recipe add so much texture and just a little bit of crunch. But the real, sweet almond flavor that makes this dairy-free french toast so tasty actually comes from the almond milk. So yes, you could make this recipe with cow’s milk instead, but trust me, you’ll be missing out! We made this French Toast with Almond Milk because it just tastes better this way. If you like almonds, you’re going to love this almond french toast recipe, and you’ll be making it time and time again. Besides the almonds and almond milk, there’s another star ingredient in this french toast recipe. It’s the Homemade Strawberry Syrup! This syrup adds a sweet, fruity flavor to the french toast. It just brings it to a whole new level, especially if you add a few fresh strawberries on top. It’s a MUCH better combination than traditional maple syrup for this french toast with almond milk. This Homemade Strawberry Syrup Recipe is easy to make too! You just need strawberries and sugar to make it, and you can heat it up in a sauce pan. It turns out to be a nice, thick syrup instead of the thin, watery syrups you find in stores or at restaurants (although you can make it as thick or thin as you like). And this strawberry syrup goes great with other french toast and pancake recipes too! 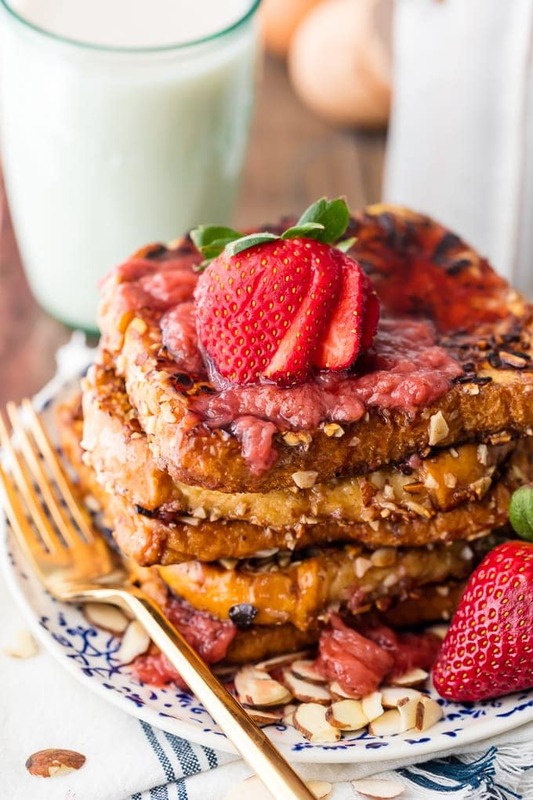 French Toast with Almond Milk and Roasted Strawberry Syrup…just talking about it is making me drool! This french toast is dairy-free by taste rather than necessity. I made the french toast with almond milk to add that special almond flavor, but I’ve also used margarine rather than real butter. You can use any type of dairy-free butter you prefer. This dairy-free french toast recipe is so good, you definitely won’t be missing anything. This french toast recipe does contain eggs, so it is not vegan. This recipe is perfect if you, your family, or a friend is lactose intolerant. However, if you’d like to venture into vegan territory, you can try using an egg replacement (though I can’t speak to how the recipe holds up without the eggs). I’d love to hear from you if you make this vegan. 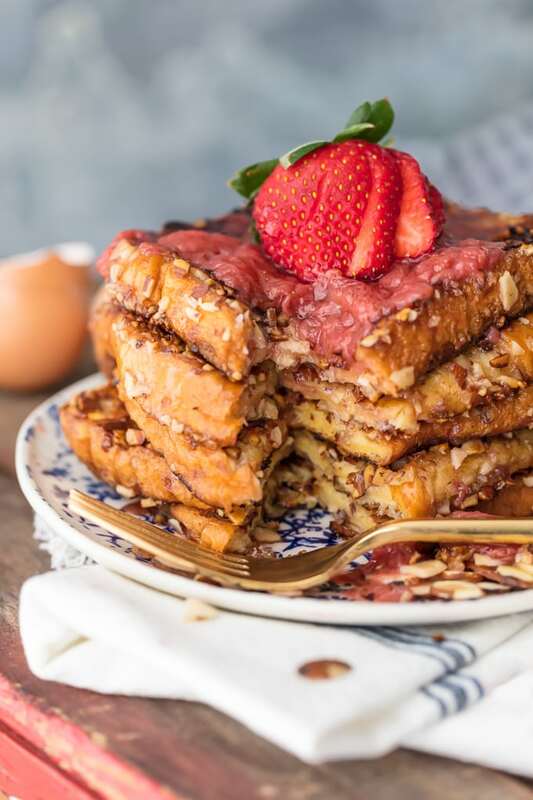 Your family is going to beg for this French Toast with Almond Milk and Roasted Strawberry Syrup every morning. It’s just SO GOOD! Plus it can be your go-to brunch recipe, and it will never disappoint. I hope you enjoy this dairy-free french toast recipe as much as we do! See the recipe card below for details on how to make dairy-free French Toast with Almond Milk & Homemade Strawberry Syrup. Enjoy! 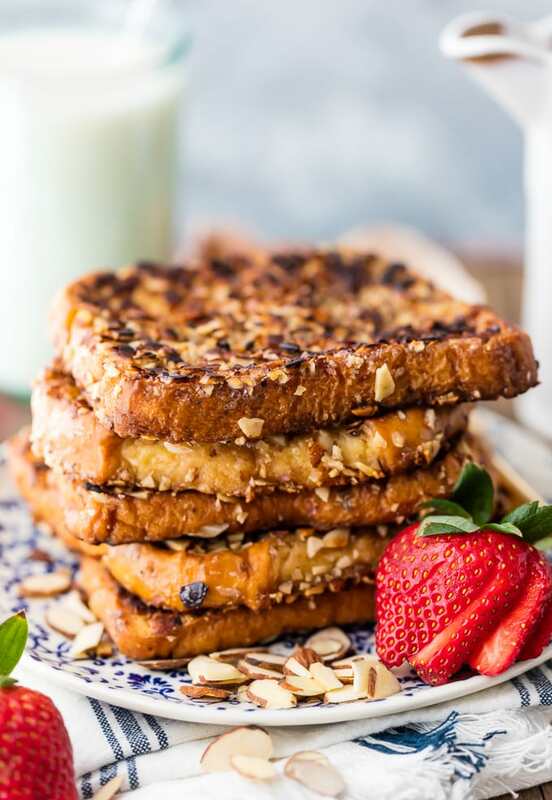 This FRENCH TOAST WITH ALMOND MILK is a great Dairy-Free French Toast recipe for those with lactose intolerance (or anyone who just prefers the flavor of almond milk). 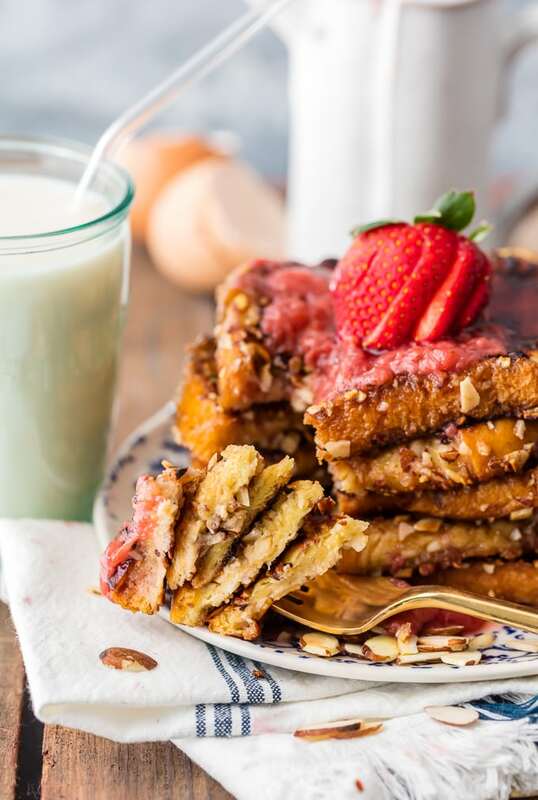 We love starting our mornings with this Crunchy Almond French Toast, and we added a delicious Homemade Strawberry Syrup! Fresh almonds along with the almond milk really adds to the overall flavor. It's unique, bursting with flavor, easy, and made with love. Combine strawberries and sugar in a medium saucepan and add ½ cup water. Stir to combine. Bring to a boil and then reduce to a simmer, stirring and crushing strawberries against the sides of the saucepan while cooking. Allow to simmer until thickened to your liking, around 15 minutes. While sauce is cooking, whisk together the eggs, milk, and extract in a large baking dish. Dip each piece of bread fully in the egg mixture, and then press both sides into the chopped almonds, pressing to coat as much as possible. Set aside until ready to make your french toast. When ready to begin, heat a griddle over medium high heat and add 1 tablespoon margarine. Add four slices of bread to the griddle and cook until browned, about 2-3 minutes. Flip to cook the other side until browned. Transfer to a plate and cook the remaining 4 slices. Serve topped with the roasted strawberry syrup. I love using almond milk in my French toast. 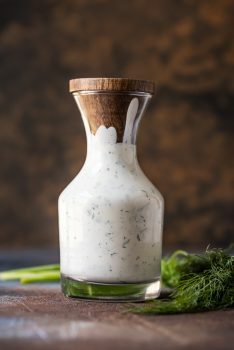 My son is dairy-free and none of us feel like we miss the milk!